The first couple of recipes I'm posting are Salmon/Aioli dishes that are both, real winners with the ladies. I was given this first recipe by our friends, Sid and Melinda. Lisa and Melinda have been raving about this one for weeks. Sid, a great bartender by the way, offers us his Baked Salmon with Wasabi Aioli. This recipe was designed for two servings, so adjust proportionally. Whisk all ingredients together and spread over salmon. Bake at 425 degrees for 18 – 20 minutes. Make sure that you don't overcook it. 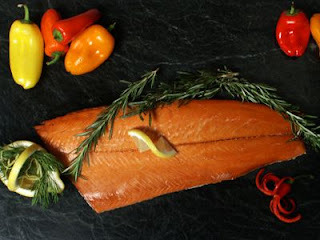 The next recipe is for my Hot Smoked, Koshered Salmon which I get frequent requests for. Our friend Toni loves it so much that she has asked me to teach it to her husband, Jeff (yes, we have lots of friends named Jeff) as a birthday present. 1. First rinse the fish and pat it dry. 2. Place it on a foil covered cookie sheet and lightly sprinkle it with white pepper and cinnamon. 3. Completely cover the slamon with Kosher salt, until you can see no pink, and place it in the refrigerator for 3 to 6 hours (This is the Koshering part.) This draws out some of the moisture and removes any fishy flavors. 5. Soak your cedar in warm water while the smoker is heating up. 6. When your fire is ready, rinse the fish in slowly running water, just to get the salt off. The cinnamon and pepper should have bonded to the fish. 7. Very lightly pat it dry, taking care not to remove any of the seasonings. 8. Place the salmon on the smoker for 30 to 45 minutes, or until it has a nice dark color and little fat pockets begins to turn white on the surface. 9. Prepare the aioli while the fish is smoking. 1. In a bowl, mix the mayonaise with 2-3 cloves of pressed garlic. 2. Add the lemon juice, and salt and pepper to taste. 3. Let sit in the refrigerator until ready to serve. Remove the salmon from the smoker, plate and serve aioli, crackers, lemon wedges, and capers, on the side. Oh! and a nice bottle of white wine (Coppala Diamond Series chardonay goes well).